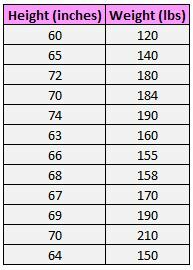 You will likely never have to compute this formula by hand since you can use software to do this for you, but it’s helpful to have an understanding of what exactly this formula is doing by walking through an example. 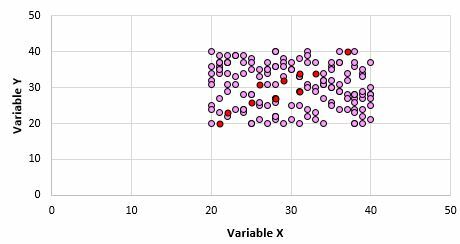 Just from looking at this scatterplot we can tell that there is a positive association between variables X and Y: when X increases, Y tends to increase as well. But to quantify exactly how positively associated these two variables are, we need to find the Pearson correlation coefficient. 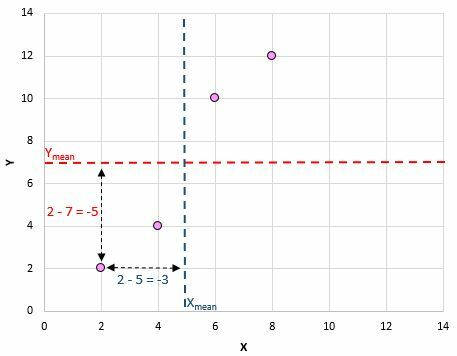 For each (X, Y) pair in our dataset, we need to find the difference between the x value and the mean x value, the difference between the y value and the mean y value, then multiply these two numbers together. For example, our first (X, Y) pair is (2, 2). The mean x value in this dataset is 5 and the mean y value in this dataset is 7. So, the difference between the x value in this pair and the mean x value is 2 – 5 = -3. The difference between the y value in this pair and the mean y value is 2 – 7 = -5. Then, when we multiply these two numbers together we get -3 * -5 = 15. Then we’ll multiply these two numbers together: 20 * 68 = 1,360. 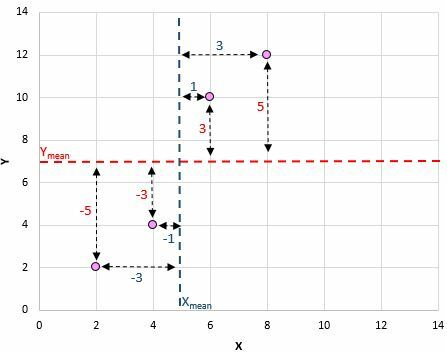 This number is close to 1, which indicates that there is a strong positive linear relationship between our variables X and Y. 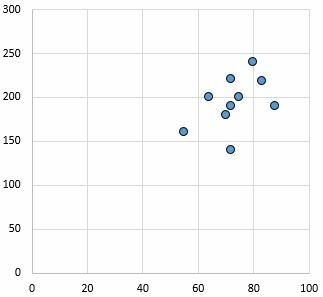 This confirms the relationship that we saw in the scatterplot. Recall that a Pearson correlation coefficient tells us the type of linear relationship (positive, negative, none) between two variables as well as the strength of that relationship (weak, moderate, strong). 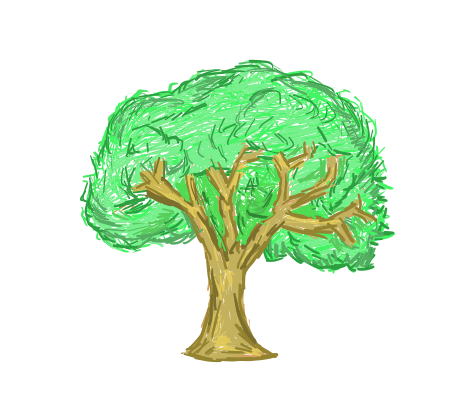 When we find the Pearson correlation coefficient for a set of data, we’re often working with a sample of data that comes from a larger population. 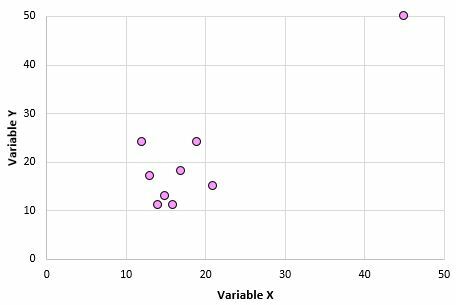 This means that it’s possible to find a non-zero correlation for two variables even if they’re actually not correlated in the overall population. 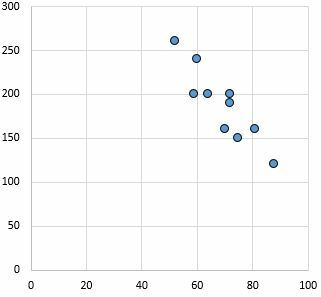 We may find that the Pearson correlation coefficient for this sample of points is 0.93, which indicates a strong positive correlation despite the population correlation being zero. 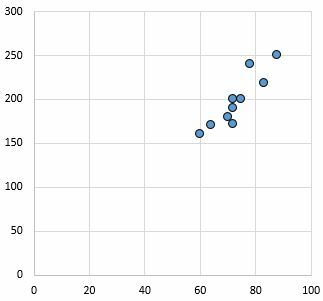 where n is the number of pairs in our sample, r is the Pearson correlation coefficient, and test statistic T follows a t distribution with n-2 degrees of freedom. 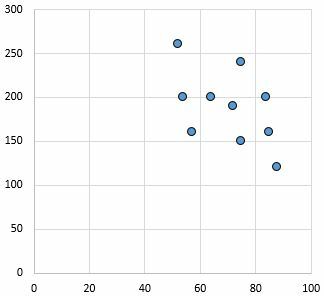 Let’s walk through an example of how to test for the significance of a Pearson correlation coefficient. 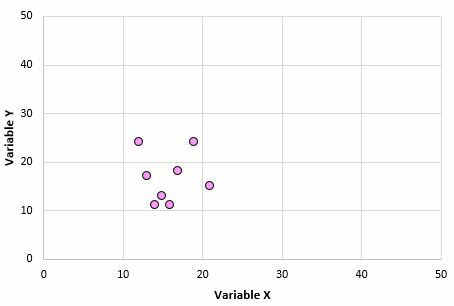 The Pearson correlation coefficient for these two variables is r = 0.836. The test statistic T = .836 * √(12-2) / (1-.8362) = 4.804. According to our t distribution calculator, a t score of 4.804 with 10 degrees of freedom has a p-value of .0007. 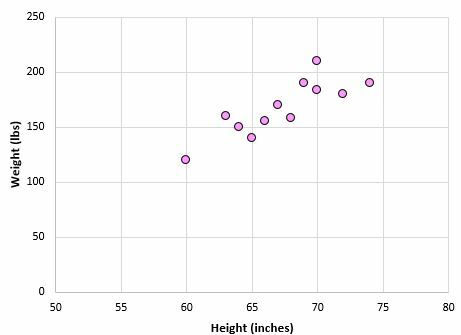 Since .0007 < .05, we can conclude that the correlation between weight and height in this example is statistically significant at alpha = .05. 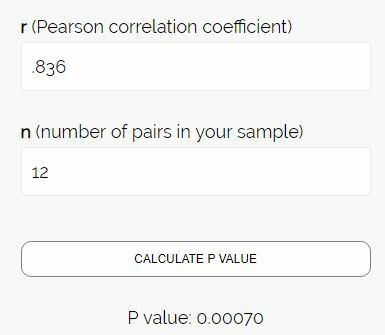 Note that we could have also simply used the Pearson Correlation Coefficient to P Value Calculator with r = .836 and n = 12 to find that our p-value = .0007. 1. Correlation does not imply causation. 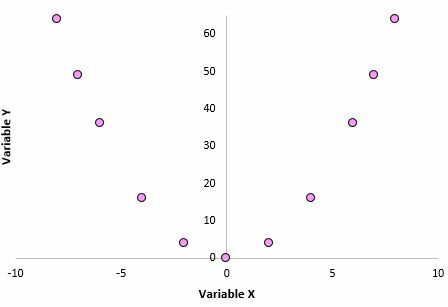 Just because two variables are correlated does not mean that one is necessarily causing the other to occur more or less often. A classic example of this is the positive correlation between ice cream sales and shark attacks. When ice cream sales increase during certain times of the year, shark attacks also tend to increase. Does this mean ice cream consumption is causing shark attacks? Of course not! It just means that during the summer, both ice cream consumption and shark attacks tend to increase since ice cream is more popular during the summer and more people go in the ocean during the summer. 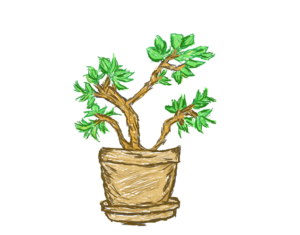 Now the Pearson correlation coefficient for these two variables is 0.878. This one outlier changes everything. 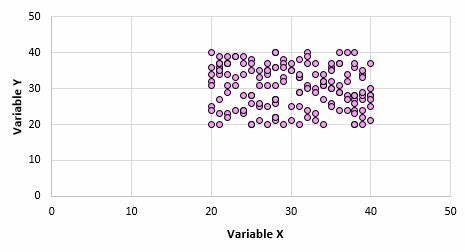 This is why, when you calculate the correlation for two variables, it’s a good idea to visualize the variables using a scatterplot to check for outliers. 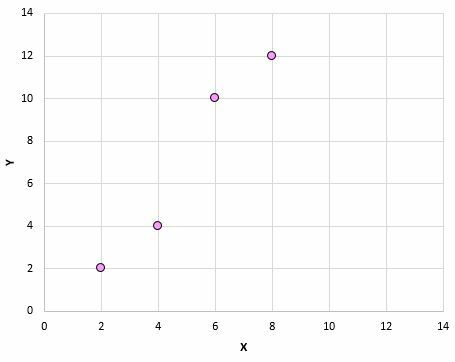 The Pearson correlation coefficient for these two variables is 0.00 because they have no linear relationship. However, these two variables do have a nonlinear relationship: The y values are simply the x values squared. When using the Pearson correlation coefficient, keep in mind that you’re merely testing to see if two variables are linearly related. Even if a Pearson correlation coefficient tells us that two variables are uncorrelated, they could still have some type of nonlinear relationship. 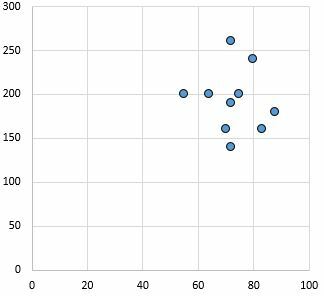 This is another reason that it’s helpful to create a scatterplot when analyzing the relationship between two variables – it may help you detect a nonlinear relationship.